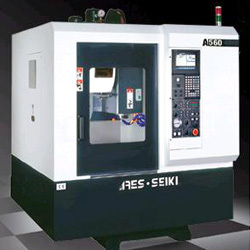 The A-series has the highest cutting tool capacity and is built for extremely intricate processing. The high speed spindle is ideal for cavity machining and precision engraving. Fully automatic full rotation, high speed, high precision. 1. Spindle speed 60~10000 rpm (STD). 2. Spindle speed 60~15000 rpm (OPT). 3. Rigid tapping 4000 rpm. 4. Spindle nose taper BT30. 5. 3 axes rapid traverse X, Y, Z: 48, 48, 40 m/min. 6. Dual electric cases (heat insulated). 7. High speed machanical ATC system T-T: 1.4 sec. 8. Directly coupled high speed spindle. 9. Please refer to the attached file for detail information and spec.